Markings: At bottom left corner, collection marks of Sir Thomas Lawrence (L.2445), Nils Barck (L.1959), J. F. Gigoux (L.1164). Parmigianino relied only on line to create gradations of light and shadow and to model his forms. A wide range of hatchings and cross-hatchings unify the drawing. Light diagonal lines create the open atmosphere of the sky, while darker cross-hatching shapes the substantive parts: David's muscular body, his fluttering cape, and the ground behind him. Parmigianino used sure yet delicate contours to define David, but Goliath's head is a mass of wispy, waving lines of beard and hair providing the flimsiest of outlines. 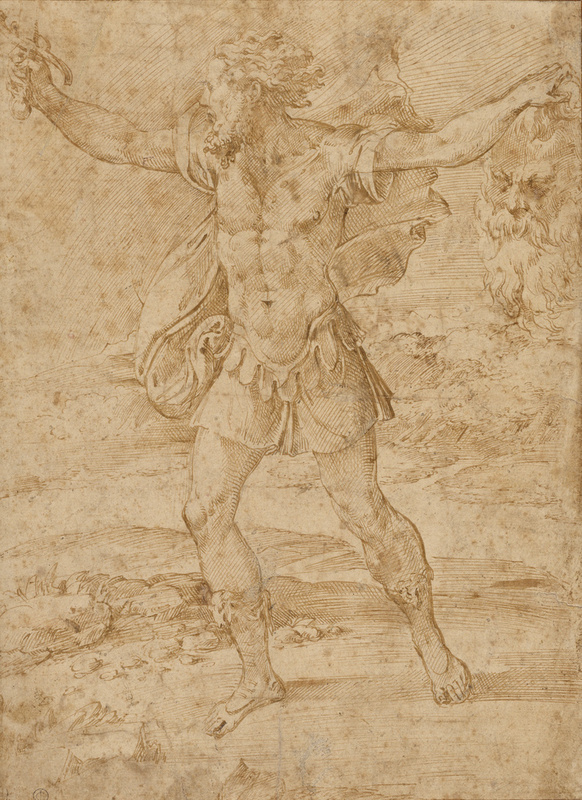 He suggested Goliath's sunken eyes with quickly jotted marks and enhanced the thrusting effect of David's dynamic step forward with his billowing cape. The sure ink lines and lack of corrections display the artist's instinctive and prolific draftsmanship. "He had no sooner taken a pen in his hand to learn to write than he began to draw marvelously," reported his biographer Giorgio Vasari.